What is the Engagement Multiplier tool? 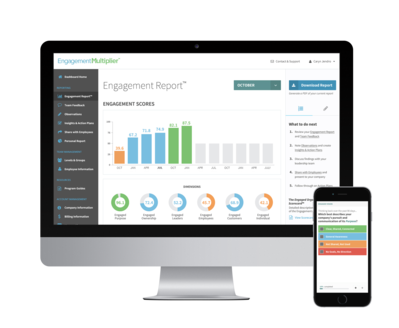 Engagement Multiplier is a superb engagement programme tool that delivers truly honest assessments. But unlike annual staff surveys this tool also helps you work towards creating an engaged organisation, so you can unlock your organisation’s true potential. So far, 93% companies have achieved “engaged” status within just 12 months of using Engagement Multiplier. In keeping with Naturally Loyal’s ethos, Engagement Multiplier gives you the tools you need to uncover key insights, plus guidance for developing simple plans of action that are easy to achieve quickly. It’s an employee engagement audit which you can use whether you have an engagement programme or not. So what makes Engagement Multiplier so effective? Just like customer service training, I don’t believe employee engagement surveys should be a one off tick box exercise. Your team want to be listened to all year round. One of the many fabulous features is that the engagement cycle repeats automatically every 90 days, starting with a unique automatically-distributed survey, accessible to employees via their phone, and only takes 5-10 minutes to complete, so has a minimal time commitment. The survey is not just about getting feedback and generating scores. It gives everyone a voice and asks questions about actions they can take to improve engagement, creating shared accountability. Survey responses can never be associated with an individual employee. This encourages open and honest feedback from your team; what this reveals is often eye opening and inspiring. It means leaders get to hear about potential issues before they become a problem so they can nip them in the bud. You don’t need to waste valuable management time devising your questions; these are provided for you to give a perspective and opinion across five dimensions of engagement, including their perceptions on customers. Your team are also given opportunities to write personal, confidential responses. So your results include both engagement scores and written feedback. Turn up the volume, press play on this 3 minute video and click on the full screen button to see an overview of this simple yet devastatingly effective tool. Doesn't this mean more work for HR, senior managers or the CEO? No. The opposite in fact. It highlights realistically sized actions that leaders – and employees – can take in the following 90 days. It promotes personal accountability from everyone in the organisation. The 90 day cycle means you can take small steps towards creating an engaged organisation, focusing on just one or two goals per quarter which is easier for you to manage and demonstrates to your team you’re listening to them and taking on-board their feedback. And gives you immediate feedback on how well your actions are working so you can make adjustments as you go. And because the survey is generated automatically every 90 days you don’t even need to remember to send it! Businesses have been transformed inside and out, for just 10 minutes a quarter.